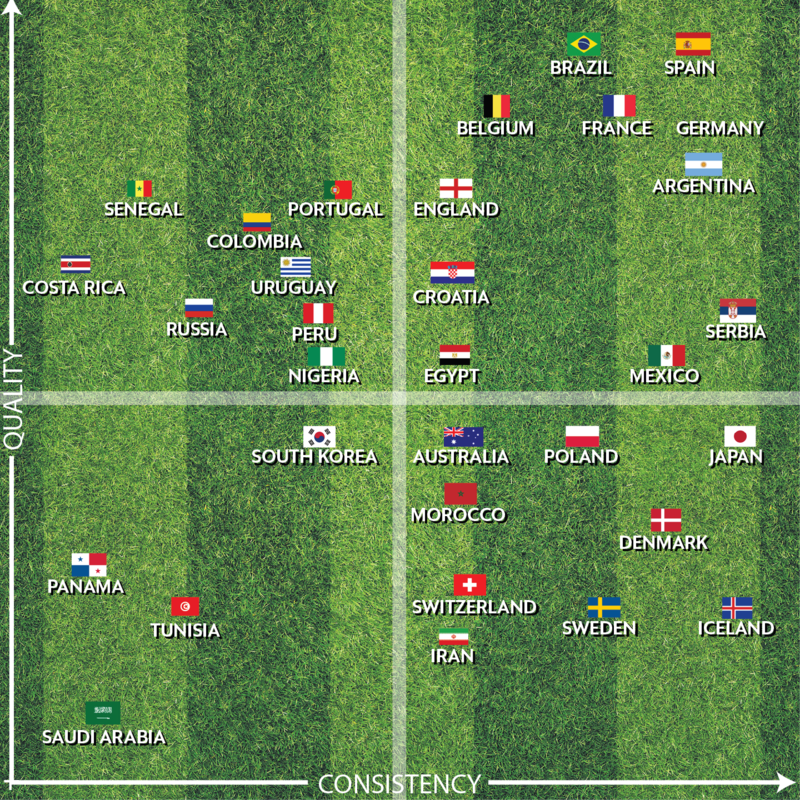 The BCG Matrix: What does it take for a team to win the World Cup? What does it take to win the Fifa World Cup? Reduce the world’s greatest sporting event to its bare minimum and it does not look all that hard. All it takes is seven quality outings on the football pitch—three matches in the group stages and four knock-out games. And lo, the cup is yours! Seven matches. Just seven. And yet, only the finest teams in the world can manage to overcome the hurdles. In fact, only a handful of teams in the world have ever managed to display the quality and consistency necessary to take home the world cup. Some of the greatest teams in world football, such as Portugal, Hungary and, of course, the Netherlands, have come close to lift the cup, but have suffered agonizing heartbreak. Across the 20 editions of the tournament, just eight teams have lifted the cup, and only four teams have made it to five or more finals—Brazil, Germany, Argentina and Italy. What makes these teams so special? What is it that they have, which other footballing powerhouses seem to lack? The secret seems to be a combination of high quality and consistency. Simple, right? Not quiet. The World Cup is a short, but intense tournament. The teams, which eventually take to the field at the Luzhniki Stadium in Moscow on 15 July (the final), will have participated in seven matches in just about 30 days, that is, one match in every four days. This is an itinerary that is almost twice as hectic as the fixtures at the highest levels played by professional footballers. And all this before accounting for the peculiar circumstances of the world cup—unfamiliar locations, unfamiliar opponents, little time to gel with teammates and, quite possibly, an unfamiliar manager who prefers playing a style of football that many of the top players are unfamiliar with. Besides, all of this comes at the end of a gruelling club season. The circumstances suddenly make the prospect of playing the highest-quality of football, with an even higher level of consistency, a daunting task. But that is exactly what it takes to win the cup. If you further break down the world cup winning formula, you will not only be able to mine the qualities inherent in prospective champions, but will also be able to decipher the four broad categories of teams which define the World Cup. Quality and consistency have, in fact, been the key to map the teams. And, here is what we get based on the Best Consistent Goalscorers, or BCG, Matrix. (Groan). In the top right quadrant, you have the high-quality and high-consistency teams: the perennial favourites who have what it takes to go the distance. These guys are Champion Material. In the top left quadrant, you have the teams who have the quality, but lack the consistency to make it to the top. These are the teams that catch the eye at each tournament with exuberant performances at the group stages, and perhaps an upset or two in the knock-outs. They produce heroic performances from individual players, who will go on to play for Manchester City for one season. They will eventually get ground out by the powerhouses. They are the Shooting Stars. In the bottom right, you have the teams that make it to each world cup, do nothing particularly notable, perform exactly as you would expect them to, and then go away with their heads held high. They play moderate quality with some consistency. Nothing to complain. But nothing spectacular either. They are the Expectation Meet-ers. And finally, you have the teams with low quality and low consistency. They will upset England one day. And lose 11-nil to Iran the next. They will not win the cup, but they will live on forever on Youtube. They are The Magnificent Minnows. So what about the 32 teams going to Russia this year? Mint presents our predictions for The 2018 BCG Matrix.